EPIC Miami is a great location for pre- and post-cruise stays or for exploring the cosmopolitan downtown business district. When you pull into the circular driveway of this 54-story elliptically-shaped, 4-star waterfront hotel, you’re likely to see one or more huge yachts docked in its private marina on the northern shore of the Miami River. Some of the guestrooms offer expansive views of the river flowing into Biscayne Bay. Looking towards the north, you’re likely to see distinctly different views. The downtown business district of Miami, where EPIC, a Kimpton Hotel is located, is in the midst of transformation. Once an area of urban blight, it is now a thriving concrete jungle dominated by modern high-rise office buildings with ground floor restaurants and retail space. Ultra-contemporary condominium and rental apartments are shooting up around them like mushrooms. According to locals we spoke to, this boom and the downtown turnaround has been inspired in large part by émigré investors from countries in South America. This boutique property with 411 rooms and suites opened in December 2008 to meet the growing number of business and leisure guests visiting the area. It is conveniently located less than two miles from the Port of Miami, making it ideal for pre- and post-cruise stays. It is within walking distance of many downtown art, cultural, sports and entertainment venues. It is also adjacent to the historic center of the city, some of which remains well-preserved and is worth exploring by foot. The high-ceilinged lobby is bright and inviting. An energetic millennial buzz is evident: In early morning, guests are leaving for or returning from a run on the scenic riverwalk nearby, or heading to or from a workout in the hotel fitness center. At lunch hour, the lobby is filled with business people and guests dining at one of the hotel’s restaurants. In the evening, limos and taxis line the driveway with singles and couples arriving for dinner, drinks and conversation. Most of the bustle is centered on either the ground level of the hotel or on the 16th floor. The former houses the lobby bar (Lilt) that serves hand-crafted cocktails; the Living Room lobby that hosts complimentary coffee in the morning and a wine hour daily for guests; and Zuma, a highly-rated contemporary Japanese restaurant that leases space within the hotel. The hotel’s signature restaurant, Area 31, is located on the 16th floor, along with the Exhale Spa and two swimming pools with a wrap-around deck that offers stunning water views of the bay. Executive chef Wolgang Birk’s healthy and inventive cuisine emphasizes sustainable seafood and fresh local ingredients. The raw bar, crudo and other appetizers were inspired. The excellent quality and preparation of the food was complemented by the attentiveness and professionalism of our server, Adrian. Guests can dine inside or al fresco on the terrace as they soak in views of the city lights shimmering on the river; or cocooning en suite with 24-hour room service. We stayed in Room 2233, one of 24 junior suites (there are also 24 one-bedroom suites). Our comfortable king bed was draped in high-quality Italian linens. Extremely quiet, the room had a wall of soundproof windows (with an outside balcony) that allowed in natural light but filtered out street noise. The space was divided into a sitting area with an oversized desk and sleeping area with a large-screen plasma TV that swiveled between the two. The spacious, well-appointed interior was tastefully designed and furnished, making extensive use of neutral colors, textured fabrics and woods. The large bathroom had twin sinks (made by Villeroy and Boch), a separate tub and shower, and private water closet. 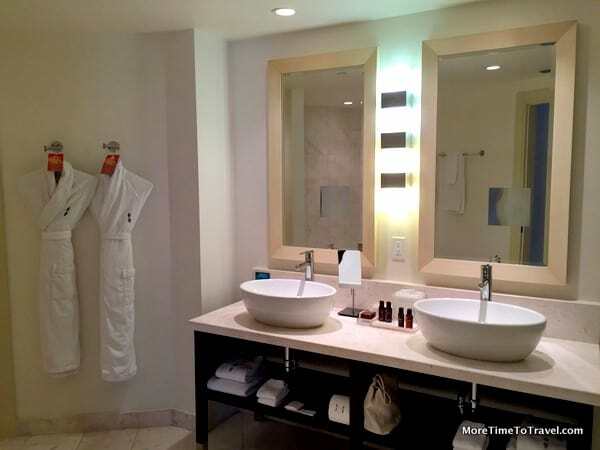 Frette bathrobes were hanging beside the sinks. One miss was the almost threadbare towels (a peeve of mine). There were sufficient electrical outlets and USB ports to meet all our tech needs and then some. The speed of the free wireless connection was nothing short of impressive. Twice-daily housekeeping service was efficient and unobtrusive delivering fresh bottled water each evening. The yoga mat in the closet was only one manifestation of the hotel’s emphasis on wellness, which includes closed circuit TV programs with yoga, Pilates and meditation. Located only ten minutes from Miami International Airport, Epic, a Kimpton Hotel is a great choice for a stay in the heart of downtown Miami. Staff was uniformly welcoming, responsive and helpful throughout our stay. While the hotel is especially popular with millennials, it was fun for us to vicariously experience this cosmopolitan side of southern Florida. See if you can upgrade to a room with a view on a high floor. Don’t miss the expansive river and bay views which can be seen from the public spaces on the 16th floor (pool deck, restaurant, bar). Allow time for a walk along the river. The hotel driveway can get congested with taxis, shuttles and private car drop-offs. Be cautious of the traffic when walking there. Whole Foods is conveniently located one block away. If you are looking for a beach, take a taxi and head east for the Miami Beaches. Disclosure: Our stay at EPIC, a Kimpton Hotel was hosted by the property and the Greater Miami Convention & Visitors Bureau but any opinions expressed in this post are our own. In the heart of Miami, on the waterfront, and close to the cruise ship pier? Sounds like a no-brainer for a pre- or post-cruise hotel :-). We like the Kimpton brand – they have some nice boutiquey hotels in Seattle.